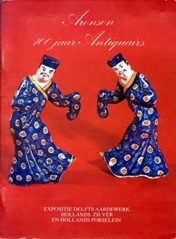 Aronson Antiquairs of Amsterdam, founded in 1881, has been publishing since 1981 at their centennial anniversary. Their publishing arm was officially founded in 2003 and since then we have published their specialized publications on the subject of Dutch Delftware. Many of these publications have become benchmark publications in their field. Museums, auction houses, dealers and private people alike, quote from what has become on of the main sources for 17th and 18th century Dutch Delftware. Founded in 2009, service company Aronson Concepts, also specialized in high quality publications, published its first book Commedia dell’Arte, The Patricia and Rodes Hart Collection, in March 2010, described by The New York Times on June 28, 2012, as “a lavish book”. The second followed a year later on the collection of Mr. & Mrs. Van der Vorm. All our publications are for sale through our webshop shop.aronson.com.